Having spent most of my life in Washington, I'm accustomed to two seasons: two months of sunlight, and then overcast skies with non-stop rain from September to June. Sometimes we'd get snow, but most of the time, the fall and winter holidays are very wet. 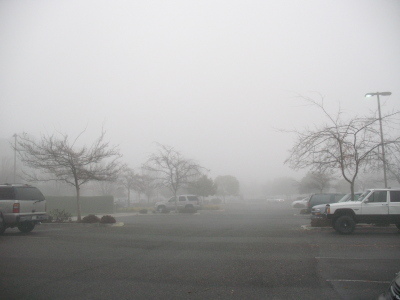 In the central valley of California, where I now live, there are also two seasons: Desert sun (hot enough to evaporate the moisture from your eyeballs) from March to November, and then two months of fog. ENDLESS FOG. I woke up this morning and saw this out the window at around 7 a.m. This was on the way to work. This was still on the way to work. This is FORTY MILES AWAY from where I started. Same fog. All day long. I got home at 6 p.m., and the fog barely let up. And from what the valley natives tell me, this is a "mild" fog. 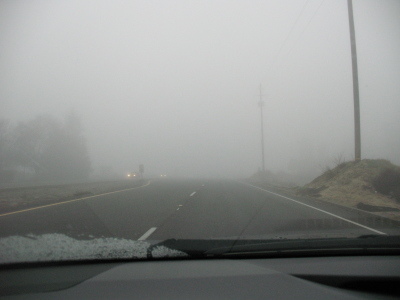 Real fog is when you can't see the hood of your own car. 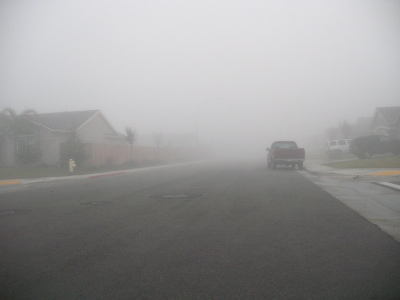 They actually have "fog days" where schools are canceled on account of the fog. Seriously. It's like living in a horror movie. 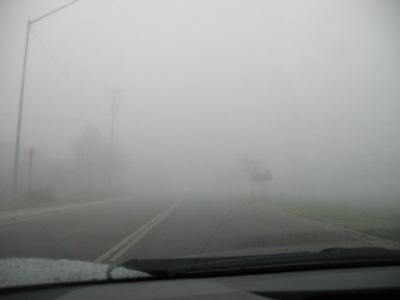 Every morning we would wake up and put on the news to see what schools had foggy day schedule. Always loved it when we did. and on a few rare occasions. Osm. Does the fog stink? We had a fog here a couple weeks ago. It was foggy when I left Tumwater at 6am, and foggy when I got to Seatac at 7am. It was foggy when I got back to Oly - the weird thing was it all stunk horribly. Like trapped exhaust. It was nasty. No - it doesn't seem to stink. It's just very thick - you can feel the water particulates in the air as you walk through it. In the central valley where I live, the air quality is generally not very good due to the lack of air movement. 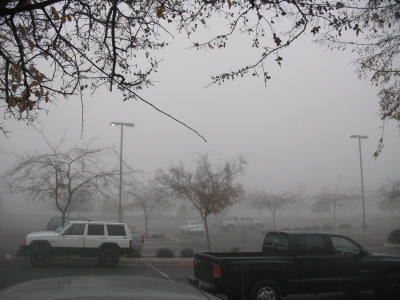 The valley just traps all the exhaust, and the air is bad until some kind of weather movement occurs. That's ... a lot of fog. I have to admit, since reading "the Mist", every time we have a thick, endless fog, the fact that I live in close proximity to two military bases springs to mind. Aye. Love them fairy dreamlands. Speaking of which, have you seen Avatar yet?